University Alliance > Blog > What does research-informed teaching (RIT) look like? What does research-informed teaching (RIT) look like? Excellent teaching goes hand in hand with excellent research. 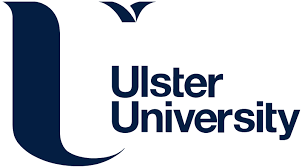 This blog prepared by the Higher Education Academy (HEA) and University Alliance, ahead of its workshop event with senior university practitioners and key higher education stakeholders, explores the latest thinking on research-informed teaching and what it looks like. Diversity is a strength of our higher education sector – and research-informed teaching can vary widely. Promoting excellent teaching whatever its form enhances the student experience, improves student employability and enriches the research culture. 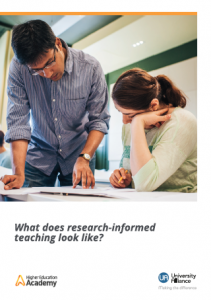 Read the full What does research-informed teaching look like? booklet here. research-based learning – where students learn as researchers. As the following case studies indicate, RIT offers many benefits to students, staff and higher education institutions as a whole. The case studies from Portsmouth University and Nottingham Trent University show that treating students as co-researchers supports student engagement within and beyond the formal curriculum, furthering knowledge and understanding, and in some cases contributing to the broader discipline. Such an approach can also increase student satisfaction, creating a sense of belonging to an institutional and/or disciplinary research culture and developing intellectual curiosity as well as research and communication skills. The Nottingham Trent case study also suggests that the experience has directly impacted on student performance. RIT has also been found to support student employability, with the rise of work-based learning giving students the opportunity to participate and contribute through experiential learning, working as researchers on real world projects. The case study from Kingston University shows that this can then have wider benefits when students share their workplace experiences with peers. Successful approaches to RIT, as the University of Lincoln case study demonstrates, focus on curriculum design, where students learn together with staff through joint activities and projects and are supported by structured interventions throughout their course, from year-one to the final-year project. However, challenges in implementing such an approach include a lack of support from the department or institution; the number and diversity of students requiring flexibility and adaptability; staff perceptions of their role and the feasibility of RIT; as well as difficulties faced by teaching-only practitioners in developing their own research. strategies that underpin the curriculum, and promotes research-informed teaching. However, this approach has proved controversial and not everyone is convinced that it is the best way to promote excellent teaching. On the one hand, it has been championed for developing undergraduate research, providing a safe environment for early career academics to build their research experience and increasing student engagement. On the other, it has been criticised for a lack of definition and rigour, ethical issues around the power dynamic in staff-student collaborations, and having limitations for teaching-only practitioners who cover teaching for research-focused colleagues at the expense of their own scholarly development. The case studies presented here seek to highlight the many different manifestations of research-informed teaching and to provoke discussion on how RIT can be used to support teaching excellence today. Jenkins, A, Healey, M, and Zetter, R (2007) Linking Teaching and Research in Disciplines and Departments, The Higher Education Academy: York. Kanuka, H. (2011) Keeping the Scholarship in the Scholarship of Teaching and Learning. International Journal for the Scholarship of Teaching and Learning 5 (1) Article 3.